Create rich exciting lightfast colours using nothing but the power of the sun and time to do the dyeing. Watch the colours develop in your solar pot as the colours slowly intermingle and create new shades. 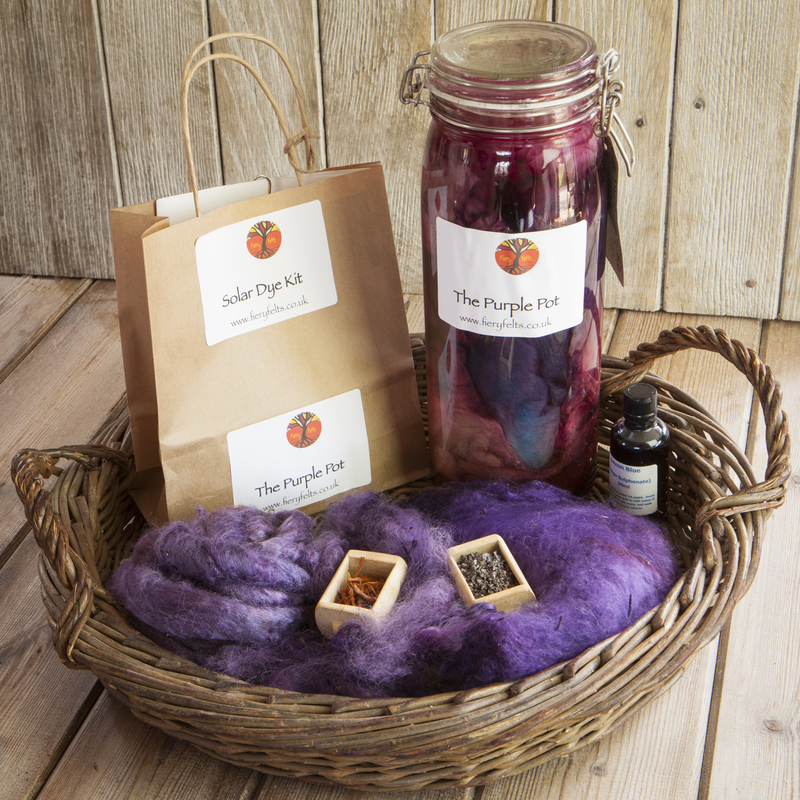 Solar Kits are kilner jars of bejewelled colour filled with natural dyes, fibres and water. The heat, even the mild heat from the sun in North Wales, works its magic over time to dye the fibres the rich subtle colours of natural dyes. Pots are multi-cloured layers so fibres, fabrics or yarns are dyed multi-cloured too. I have been developing this technique for nearly 15 years now and year on year have found the dyes which dye well at low temperatures, and which give exciting colour mixes. All the kits come from this experience. In the The Purple Pot kit you will find all the colours to make a rich red purple and piece of muslin to tie up the dye chips ,and full instructions along with the mordant (fixative). A 1.8 or 2 litre kilner jar (available from most hardware stores or from IKEA). Old jam jar or tin to dissolve the mordant in. Please note the colours obtained may vary from those shown as different waters can subtly change dye colours. This kit is not suitable for children under the age of 14.